1. Mix all the dipping sauce ingredients together and set aside. Mix the plain flour and cornflour together in a large bowl; season. Add the eggs and 110ml cold water, then whisk to a smooth batter. Divide between 2 jugs. 2. Heat 1 tbsp oil in a 23cm non-stick frying pan over a medium heat. Make the first pancake: reserve 3 tbsp batter from one jug, then pour the rest into the pan, swirling over the base. Scatter over ½ each of the cauliflower, salad onion, chilli and prawns. Drizzle over the reserved 3 tbsp batter and fry for 4 minutes, until the underside is golden and crisp. Using a fish slice or palette knife, flip the pancake and fry for 3-4 minutes, until cooked through. 3. Invert onto a plate, keep warm and repeat with the remaining batter and ingredients. 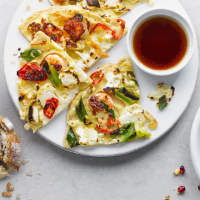 Cut the pancakes into wedges and serve immediately, with the dipping sauce. This recipe was first published in Fri Sep 01 17:01:11 BST 2017.